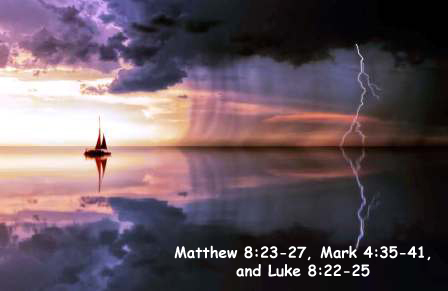 Jesus Calms the Storm it is accounted in Matthew 8:23-27, Mark 4:35-41, and Luke 8:22-25. Jesus spent his time near by the lake, river and sea shore because of beauty and quietness. So, that this place will be calm to share the word of God. And because of its all age people flocked around Jesus to listen him without resting Jesus and his disciples spread the word of God. All the people were very much interested to listened Jesus. Jesus had been healing and preaching all the day. So that everyone will be getting a good moral lesson to follow in daily life from Jesus Calms the Storm story. Jesus and his disciples were tired and in need have rest so, Jesus fell asleep. After sometimes wild wind began to blow sail on the water. Dark clouds blew across the sky and boat rolled from side to side. Lightning flashed, sails were filled the wind. The storm was very furious. Peter, John, James and Andrew spent their lives fishing took courage and tried to save themselves because they were very professionals for this situation. After a lot of their struggle they remembered Jesus. Master sees what is happening here. “Lord save us! We perish, they said,” Disciples were very much afraid and thought that they are going to die now. Lake Galilee was a very large and often storm on it. Jesus stood and raises his hand and said, “Peace be still to the water and the wind.” Then everything was all right. And it happened because Jesus had God’s authority and save their lives. So dear believers it happens in our life we will have many problem's first will try to solved when it is not possible for us then will ask help from our friends then also if it is not solved then finally and last will be asking help from God. But here we must give first priority to God because everything is possible for him.